IP Office Linux servers and IP500 V2 do not support the manual generation of a Certificate Signing Request (CSR) where the private key is retained within the server. Either a web form based request or a third party tool to create a CSR can be used. So, to request the 3rd Party Certificate you need to create a CSR, most providers will have a list of instructions based on the tools you have available. For this guide I will be using openssl on a Linux PC. Have used this same process using Terminal on a MAC. Organization Name: The legally-registered name for your business. If you are enrolling as an individual, enter the certificate requestor’s name. Organization Unit Name: If applicable, enter the DBA (doing business as) name. Common Name: The fully-qualified domain name, or URL. A note about this. 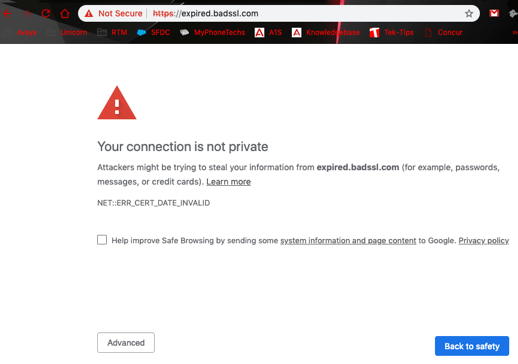 What i found is that when setting TLS, occasionally the phones would not accept the certificate, and hence, not connect. When you would change “SET TLSSRVRID” from 1 (default) to 0, then the phones would connect. After talking around, there was an assumption that because you use the WAN IP for the phones, and the certificate is built for the FQDN the certificate would be invalid. So, i have update the below to build a certificate where you can have the FQDN as well as the WAN IP. when you build the san.cnf below, you can add in Subject Alternative name, for other hostnames as well as IP address. Copy the contents of the CSR and either attach or paste it for the Certificate Provider. 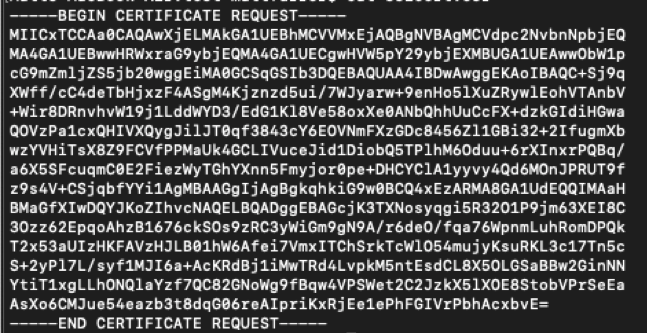 When Pasting include everything from the Begin to the End Certificate Request line (as pictured below). The Provider will require Domain Validation. The Provider I used for this setup used an email sent to the listed Admin contact under the Domain Registration information. The provider will send you an email with the validation code. 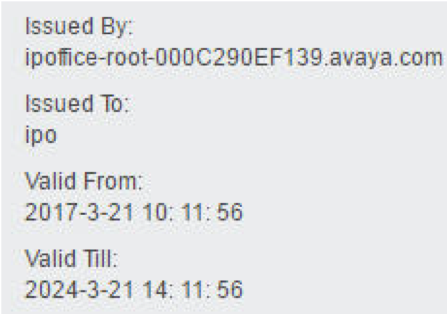 From that folder run the following Command. You will be required to enter a password for this package, which you will need when setting the certificate in the IP Office. 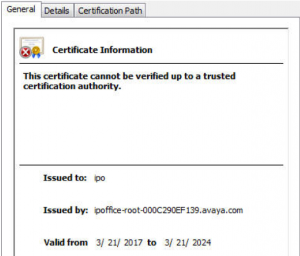 Now we need to load that new p12 Certificate Package into the IP Office Certificate Manager and set it as the Active Certificate. After applying this new Certificate, all web services on the IP Office will be restarted to start using the new Certificate. 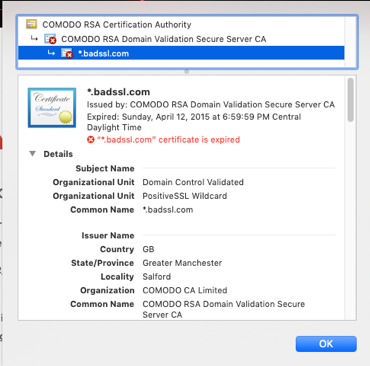 Now all devices that connect will trust this Identity Certificate, since it’s chain can be traced all the way up to a Trusted 3rd Party Root Certificate Authority. 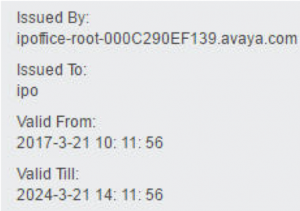 To Check and see the dates on the active Certificates you can use the following search string from the CLI logged in as root user. 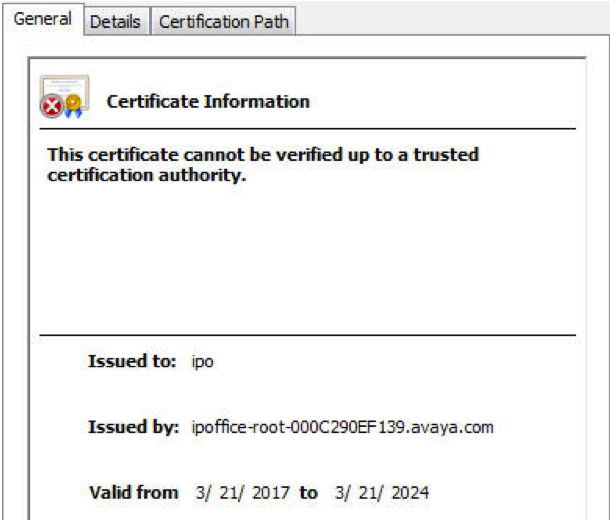 For testing purposes you can load any Certificate Package (p12) file on an IP Office.